Now, more than ever, you really need to convert every store visit into a sale, right? You work so hard and spend so much to generate foot traffic but are you doing everything possible to convert shoppers into buyers? Are you responding to what’s been called ‘The Experience Economy’? People have responded by the billions to the immediacy and the value offered by ecommerce and increasingly mcommerce. With the option to hop online and buy whenever they want, customers’ functional shopping needs – range, convenience, price-competitiveness, recommendations and reviews, deep product information – have been met. So when they take time out to visit your physical store, they’re looking for something different. They want to step into a world where they are delighted by a unique experience which rewards the time they invested. Traditional retailers need to secure their place in the shopper’s new world by building on their strengths and exploiting online’s weaknesses whilst at the same time integrating its best tricks into the store experience.. With no retailing experience, Apple went from being a tech manufacturer to having the world’s highest yield per sqm of retail floor in just a few years. As online giants such as Amazon start to push into physical stores, beware the traditional retailer that isn’t thinking very hard about how they can optimise the store experience to satisfy needs and drive conversion. The pace of development in store-based technologies is breathtaking as retailers start to accept that tech-based experiences can provide a competitive edge that online retailers can’t replicate. In fact technology itself can be a great brand differentiator. The variety of ways to integrate technology to transform a shopper’s buying experience is huge, ranging from basic digital signage using screens to replace the old paper posters (adding video impact and removing paper wastage), to fully immersive augmentred reality tools that allow you to visit virtual worlds to try out a product! 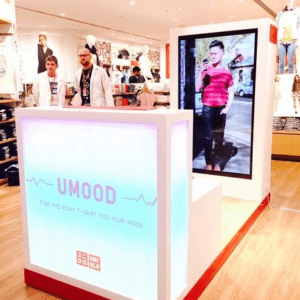 Take clothing retailer, UNIQLO for example, who created ‘Umood’ here in Australia, a neuroscience- based tool that reads customer’s neurological reactions to clothing shown, and recommended products to compliment the consumer’s state of mind. What a great way to broaden customers interest in offerings they may not have considered.Any number of fashion retailers now offer digital interactive change rooms. These come in several guises. Customers’ product selections can be automatically identified as they enter the changing room so that a recommendation engine can then suggest (ie upsell and cross sell) matching accessories which they can request to be brought to them using a touchscreen display. Others allow you to try clothes on, activate a scan and then see how you look wearing virtually displayed accessories. It’s fun and functional for the customer, and effective selling for the retailer. Another local example is Sheridan Sheets’ use of virtual product merchandising. Obviously there’s a limit to how many bedspreads you can display, and stacking them in shelves doesn’t show the product to its best advantage, so Sheridan use touchkiosks where the user can scroll through images shown. Laminex takes this a step further, offering kiosks to let you overlay your selected combination of finishes and colours onto various virtual kitchen environments to help you envisage the end result, all assisted of course by a knowledgeable sales assistant who uses the technology as part of the sales process. 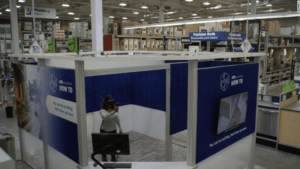 US home improvement store, Lowes takes it a step further, allowing customers to step into a room that uses 3D technology to show exactly how these products would look together.A great example of using technology for operational/customer service purposes is the use of mobile devices by sales staff to empower them with information on demand – from what’s the difference between those two washing machines to what kind of fasteners you need to install them. A Motorola survey showed that when shoppers received guidance from a retail associate armed with a mobile device, 43 percent reported an improved shopping experience. As with so many examples of technology, this has the added advantage of collecting customer data and insights – as you collect each touch or slide of the finger, you get data about what customers are asking about. Suddenly the store becomes a valuable source of behavioural data that cannot be collected online. Although the cost of all technologies is plummeting, integrating it into your retail concept is a big step. Selecting the best technology can be difficult and it’s easy to get caught up in the hype and lose sight of your goals, so where do you start? Well the two most important building blocks are your own team, and of course the good old customer! Define their shopping and decision making process; what is their mindset incoming to the store, what it is they want in terms of experience, information, entertainment, interaction, engagement and customer service? Then start to explore the many ways technology can impact and optimise each of these areas. For your team, don’t leave this to a single silo. How many retailers have an innovation budget, let alone a suitably qualified and empowered manager? A major issue is project ownership; whilst these technologies serve marketing (and sometimes training) objectives, they involve the kind of technologies that are generally designed, procured, managed and even funded out of the IT department. Often the two functions work at cross purposes or even in opposition! Create a cross-functional team to work on the project – marketing, retail ops, IT, store design and merchandising all play a role. You MUST also secure top down support. Did you know that Forrester Research predicts that one-third of companies in the B2C space will begin changing their business structure to get closer to the customer and effectively compete on the basis of experiences? These companies will move from functional-siloed organizations that prioritise efficiency and control to customer-driven matrix structures. There’s so much more to say, so for a casual and informative chat on how we take a customer strategy-led approach to customer-facing technology, contact us on 1800 737 266 or ask@permission.com.au.